I’m thankful that it’s Thursday so I can not just talk about my Thankfuls this past week but because it’s also the day I share what Angel Sammy has sent to me from the Rainbow Bridge for his Thoroughly Poetic Thursday post. That’s something to be thankful on its’ own! If you want to join in the thankful Hop – click Brian’s badge above and you’ll be IN! Share what you’re thankful for – you’ll be glad you did. Today I am thankful that the sun has returned. Florence’s aftermath which was by the time she got here merely a lot of rain and not so much wind was just two days of ICKY and WET and we certainly can handle that compared to all those who had to endure and still ARE enduring what Florence did to them. We pray for them every day. We hope the water recedes and that rebuilding will begin……….ONWARD. This past week we learned that we lost a good friend – sweet Madi the Diva……she was needed at the Bridge and we are all sad about her parting but know she’s in good hands with all the Angels taking care of her there. We have been praying that her Mom and Dad will think of her being well looked after just as they did for 16 years. 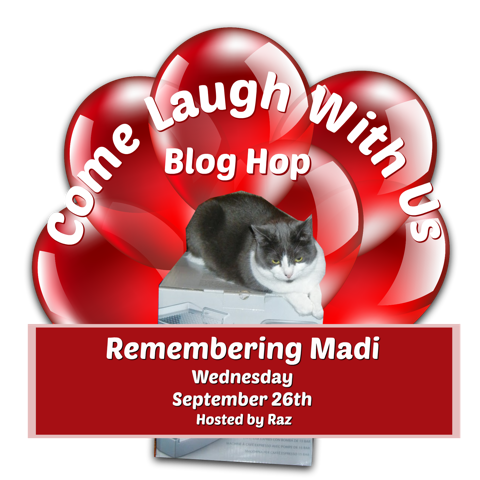 At the end of this blog post we will have information on the Blog Hop that our friend and Madi’s long-time boyfriend Raz from Friends Furever is hosting on September 26th. It will be fun – it’s what Madi wanted! Now let me share what I got from Angel Sammy! Another week has passed since we last met to exchange poetry fun – a sad week because Madi made her journey up to the Rainbow Bridge where she was hugged and hugged and hugged by me and SOOOOO many other Angels too numerous to list here. Let’s just say she is missing her home but knows this is where life DOES go on for all of us. She makes a beautiful Angel as you can imagine. As the story she told brought magic to the night…..
What dreams we would have from the stories she told…..
Childhood memories are FRESH, although now I am old……….. I have to admit, when I was a kitty living with Mom and Dad, sometimes my Mom would weave a little tale about how much she loved me and how happy she was she found me and I really did love “story time”. I know some of you still do have story night with your Mom and I think that’s wonderful. Teddy rarely sits still long enough for Mom to make up a story for him but they are close in other ways. I hope the flavor of the joy of storytelling came through in my poem!! Now – here’s your photo inspiration for NEXT week – I hope it brings some ideas to mind. This one should be a great one to write a poem about………………so I will look forward to seeing YOURS next week! I hope it’s a date? Poetry is a lot of fun to write…….give it a try. Thank you Angel Sammy! I like your poem this week. I think I’ll give story-telling a try. Mom is always trying to get me to listen to her and if you liked it – I bet I will too! Recite a poem…karaoke, just a picture with a box, etc…anything goes no rules except RED! RED was Madi’s favorite color!!! There is a link set up at Living Laughing and Barking in our Backyard so Madi’s Mom and Dad can see all your wonderful posts. Is it Thursday already? Where does time go? I’m just a little guy – not even two years old yet – but time really does fly by just like my Mom and Dad are always saying. Once a week we gather together on Brian’s Blog Hop though no matter HOW quickly Thursdays come, in order to share what we are THANKFUL for. You can join in if you like – just click his badge above and enter by using the LINKY tool. Share an share alike right? What am I thankful for this week? You might think this is a weird thankful but I truly am thankful that we had some SPRING in the middle of Winter. We had several days in the 60s and one that made it to 70! What’s with that?? It was really great because I whined at the front door three or four times and got a passing human to put my harness on me and take me outside for a little bit of DIRT TIME. Instead of frozen ground I found some nice loose dirt in Mom’s front garden and before she could get me OUT of there I managed to hop/dig/roll around to my heart’s content! Just like a little piggy (Bacon my friend sorry about that!). Mom brushed me off and of course when I got inside I got my feets (all four of them) washed with a cloth which I didn’t like but it was SOOOO worth it. It was Spring for a little while…………..we are now back to the 30s and 40s so I’ll have to wait a few months for more DIRT. We just live in the moment and the moment is now…. It’s a match made in heaven AND the “Bridge” up above. For pets and their people are JOINED AT THE HEART………. If you wrote a poem today about that cute photo of the child and pup, please share it with us – tell us in comments that you have a poem for us to read – give us your blog link so we can visit you OR if you prefer, write your poem in our comments and we’ll see it here and now! Here’s your “inspirational photo” for next week…………..let’s see what we can all do with this one when it comes to writing a poem shall we? YAY! I like this one………………………..all sorts of things come to mind (including me prowling around looking for mice!). So, how about it – join me next week in writing a poem? I promise once you try you will be hooked……………honest. I’ll be waiting for you next Thursday with my “oh so very French” beret – perfect for writing poetry oui???? Thanks Angel Sammy. I love that photo of the kid with the pup and I like the one for next week too. Thanks for never ever letting me down either – you always get your poem to me in time to share on Thursdays. Now if you’ll excuse me, I think I’ll take my Dad for a walk!